It's been a while since we've witnessed a contextual advertising screw up. While we're sure they still happen all the time and people have, for the most part, just become immune to them, it's still intriguing to see them pop up from time to time. 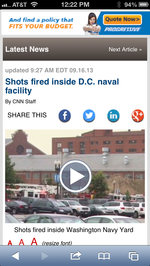 Adrants reader Micah Donahue sent us this mobile screenshot of a Progressive ad banner above a CNN story about today's shooting inside a D.C naval facility. In the banner, Progressive's Flo can be seen aiming a gun at the viewer. 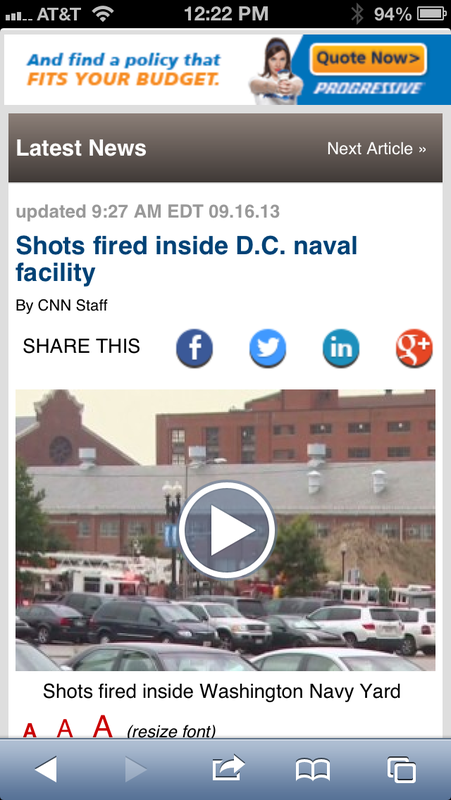 Of course it's not an actual gun but the placement of the ad above a story about a shooting is, at best, disconcerting. To be fair, it's not even clear whether or not this is a contextually served ad. It's appearance could be completely random. Even so, an ad that has an image which appears to look at though someone is aiming a gun at you is probably not the best creative execution (no pun intended) to have in your rotation.